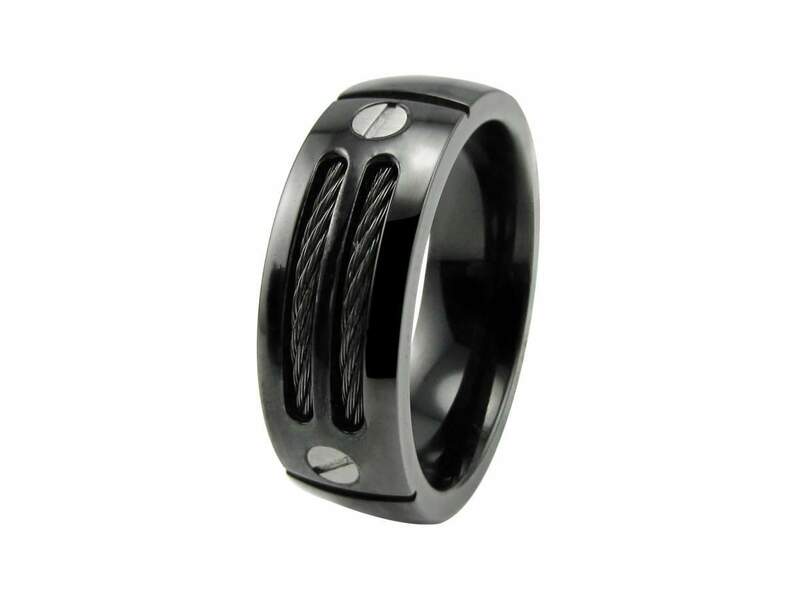 Lightweight and gently domed, this 8mm black titanium ring makes a unique statement on any man's hand. 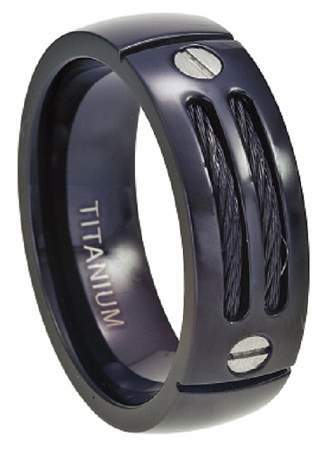 Similar to some well-known designer creations, these men's black titanium cable rings feature two cut-out grooves that expose black cables, accented by a silver-tone titanium screw on each side. 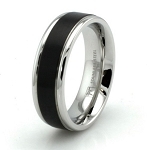 This glossy black titanium ring is 8mm wide. Stylish, strong, doesn't chip or scratch. Great deal! 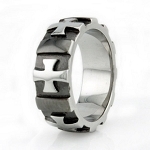 My fiance picked out this ring for his wedding band. I was skeptical at first cause the price was so low. We received the ring quickly and it looks fantastic. He's already received lots of compliments. The sales experience was simple and painless, the postage was prompt considering that I live in beautiful Australia, and the quality was what I expected and the fit was just as good. Verdict, I will return! Hi the ring arrived in excellent time for our five year anniversary. I chose this as I call myself Steele Threadz so it was a perfect item for my hubby to wear and have me with him all the time. The black is coming off the steel cable but it means it is more accented and I prefer it that way. Bought this ring because my husband misplaced his wedding band and hated going anywhere without on, so I found this ring and he looooooves it! People are complementing how unique it is and I love the sleek look. Shipping was extremely fast and I would totally order from this site again!